You don’t need to sail on a ferry to escape the bustle of the Greek capital: take a short ride and you’ll find superb local beaches along the sheltered Saronic Gulf stretching from the southern suburbs of Athens to the southernmost point of Attica, Cape Sounio. Just 10 miles south of the city –typically a 30-40 minute drive– you will find a place where urban sprawl gives way to an idyllic palm fringed setting. Take the opportunity to swim, relax at a waterfront cafe, walk along the picture-perfect pedestrian streets and the marinas, exercise your favourite water sport, shop in one of the area’s modern shopping centres, dine by the sea or entertain yourself in one of the coastal avenue’s buzzing clubs – young people’s favourite choice– that have actually brought a touch of Mykonos in town! Summer in the city doesn’t sound that bad after all, does it?! Located very close to Athens, yet away from the hustle and the bustle of the city, a wide range of activities on offer and an amazing view to the Saronic Gulf are the reasons why Faliro is the ultimate summer hot spot for the Athenians! 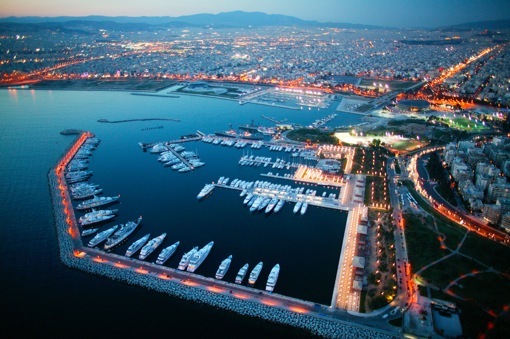 It’s trademark is of course it’s marina, a mega-yacht destination that infuses a cosmopolitan flair to the area. Flisvos Park on the other hand is ideal for leisurely strolls and carefree bike rides. Beautiful coasts, recreation parks, playgrounds, shopping centres and stylish restaurants are there to keep up your summer carefree mood! Extra Tip: Every Wednesday to Saturday evening you can ride a bike at no cost for 1.5 hours borrowing it from a specially created kiosk located between the tram stations “Flisvos Park” and “Flisvos”. Free bicycles are available from 5:30 to 8:30 PM from Wednesday to Saturday every week until September 30th. All you need to do to get yours is to go to the kiosk and present them your ID and tram ticket up to 1.5 hours in advance. Happy riding! • Glyfada: one of the most elegant districts of Athens, Glyfada stands out for its sandy palm-fringed beaches, its cosmopolitan clubs (where the pulse of the Athens nightlife beats), luxury hotels, boutiques and restaurants as well as its marinas, a much preferred yacht-mooring place for a getaway! Swim in crystal clear waters or enjoy a frappe, a favourite immensely refreshing coffee drink! The authentic frappe is made with Nescafe, and is drunk through a straw! Extra tip: if you are a golf enthusiast you will be thrilled with the Glyfada Golf Club, the city’s modern 18-hole course! • Voula: just two miles south of Glyfada lies Voula, home to two amazing organised beaches and the Riviera’s biggest beach clubs. Enjoy during the day a colourful summer setting that brings to mind a real amusement park with modern beach bars, jet ski equipment, beach volleyball courts, a vibrant dance deck and exciting waterslides, whereas at night you can enjoy a cocktail in one of the district’s elegant clubs! Extra tip: Voula A’ beach has been awarded a blue flag this year, which makes it ideal (and safe!) for families as well. On Voula B’ beach disabled people can also enjoy a swim thanks to the special infrastructure that has been installed on the beach. Vouliagmeni bay, its beach nestling in a beautiful location, before Mount Hymettus. A marina and a brace of private beaches are its trademarks whereas the picturesque harbour offers stunning views of the distant Saronic Gulf islands. Astir beach on Apollonos Street with its shallow, delicately turquoise water, smooth sand, excellent facilities and blue flag certification for cleanliness is one of Attica’s most luxurious and most popular beaches. Opposite Astir beach lies the public beach, which has no facilities and therefore no entry fee. If we add the bustling nightlife, the elegant cafes and restaurants and the luxurious hotels, Vouliagmeni is definitely a summer hotspot that you cannot afford to miss! Extra Tip: Vouliagmeni Lake, only a five-minute walk from the little square in the centre of the town, lies “sunk” (Vouliagmeni meaning sunk) in the remains of a huge limestone cave fed by lukewarm springs welling from underground. The lake’s mineral and brackish waters feel absolutely silky while swimming whereas it is reportedly healing for rheumatism and arthritis! • Varkiza: Beyond Vouliagmeni lies the bustling little resort of Varkiza, where an outstanding seascape unfolds with impressive coves below the coastal road. You will have the chance to swim in free or organised beaches with azure waters, to exercise your favourite water sports or enjoy a delicious meal in a picturesque taverna by the sea while sipping a glass of ouzo which perfectly complements fresh seafood! Extra tip: Windsurfing enthusiasts will be thrilled to exercise their favourite sport in Varkiza since it is considered to offer the best windsurfing infrastructure! The coastal road continues through marvellous tourist resorts such as Lagonissi and Saronida and ends at Cape Sounio, Attica’s southeastern tip. There you will find the impressive Temple of Poseidon – the last piece of the ancient Athenians’ homeland every time they sailed into the Aegean. Watching the sunset filling the sky with every shade of mauve and pink and making the sea glowing like a sapphire is an unforgettable experience that will weave a powerful spell over you.